Yesterday was a big day for the Landmarks Preservation Commission. A day of hearings watched closely by both preservationists and big real estate. It was all part of the so-called “Backlog Initiative,” the ambitious plan devised to address the buildup of 95 properties previously awaiting judgement by the city (85% were calendared more than twenty years ago). 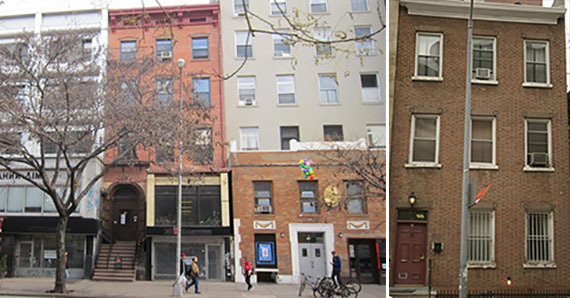 Two federal-style Lower East Side buildings, in particular, did not net protective status – 2 Oliver Street and 138 Second Avenue. The LPC first considered 2 Oliver Street back in 1966, according to public records. Right after the body was establishment, in fact. It was designed by Robert Dodge in 1821, and leased to architect James O’Donnell, who designed the nearby Fulton Street Market, among other achievements. The address was considered one of 13 Federal-style homes the GVSHP and New York Landmarks Conservancy recommended for landmark status in 2003. 138 Second Avenue is another of the Federal-style vintage. Located between St. Mark’s Place and East 9th Street, the building has been sitting pretty since 1832. It was first calendared by the LPC in 2009. The building’s heritage is a case-study in the neighborhood’s evolution, from premiere upper class living to German immigrant cultural center (“KIeindeutschland”). The Backlog Initiative was originally proposed in 2014 with the goal of quietly de-calendaring all sites without hearings and input. They later changed tune after the collective protest of several preservation organizations like the GVSHP.